Join me this Sunday, June 14th, in NYC! 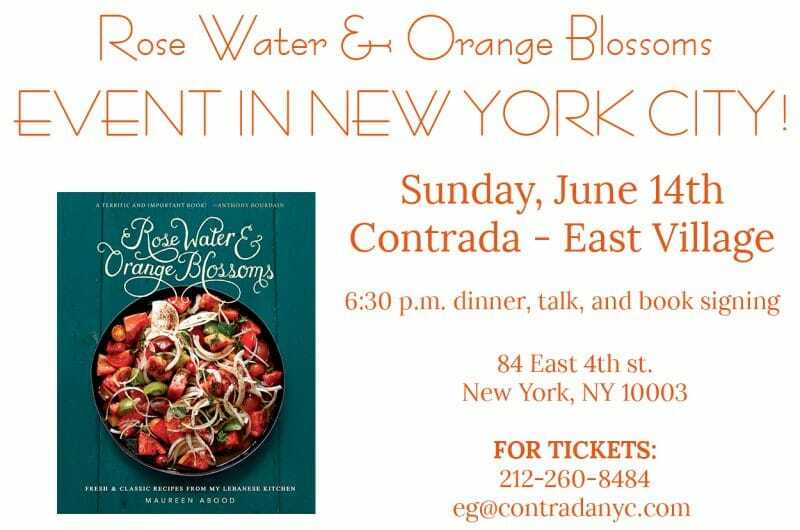 Home » Rose Water & Orange Blossoms Blog – Fresh and Classic Lebanese Recipes » Techniques » Join me this Sunday, June 14th, in NYC! 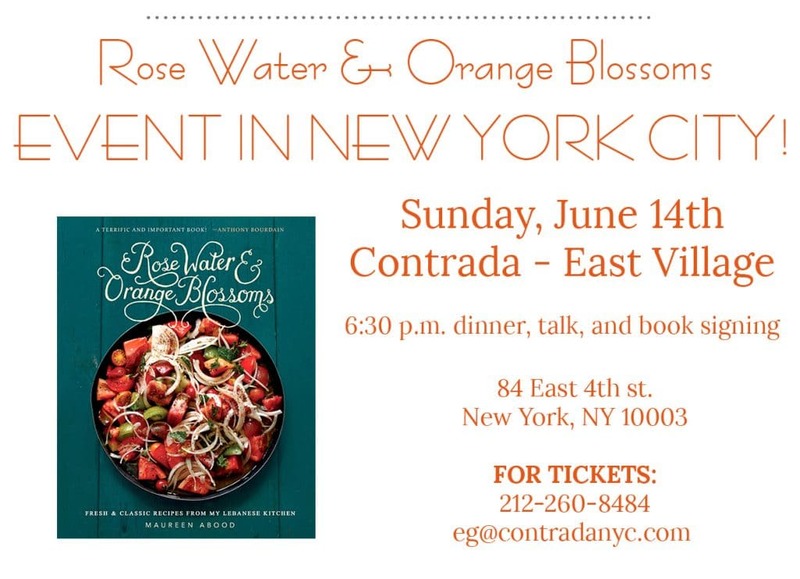 This is just a quick note while I’m out sharing the Rose Water & Orange Blossoms cookbook to let you know that we have a special event planned this Sunday evening, June 14th, in New York City! Join me at Contrada restaurant in the East Village at 6:30 for an absolutely wonderful menu inspired by the book, with delicious wine and a discussion about the book—call 212-260-8484 or click here right away for reservations. And I thank you so much if you share this with friends you have in NYC who you think would enjoy an evening of delectable food and conversation, plus book signing! Hope to see any of you in the NYC area there so we can say hello and meet in person…. 4 Responses to "Join me this Sunday, June 14th, in NYC!" Alas, I’m not in NYC, but I’d love to attend one of your book tour events. Is there a schedule someplace online? My Google-fu has failed me. Nina! Click here to see events! I’d love to see you too! Hi Maureen! I have purchesed your cookbook! I have been paging through it and just love it. The recipes are luscious and trendy and the pictures are gorgeous and I loved too the warm hearted stories of your family and love. A big congrats! !